Issue 16 is out now, and in full colour throughout! Father was a man of few words, but when he did speak you remembered. He once told me to live in the moment. Regrets are a sickness of the mind, he said with the intensity of a preacher. Here was I trying to start anew, to live in the moment, and yet my mind was cluttered with his callous little homilies. He was overseeing my life still, albeit in my head. At thirty thousand feet I heard him speak my name. Head groggy from lack of sleep and too many in-flight whiskies, I opened my eyes and saw his face staring back at me through the porthole. The hunger in his gaze appalled me. Then he was gone even before we started dropping through the clouds. Four hours later, as I leave the motorway and head north into the valley, I remind myself that the reason I’ve travelled halfway round the world is to come home to my dead. When Laurie Turner said he saw Marilyn Monroe in our sitting room, I thought he was a fool, and I told him so. But it was more fool me, as it turned out, because that’s exactly what he did see. Marilyn, pouting with her reddened lips, and her white dress billowing out so that it almost brushed the television. Just because she wasn’t there, doesn’t mean he didn’t see her: that’s what the doctor said. They were draining the fish pond in the tiny walled garden outside his window. Colin awoke to the sound of their voices: Jimena, who owned the house with her husband Tomas, and that of Madih, the young Moroccan man who carried out repairs around the property. Colin flung open the wooden shutters and his first thought was that Samantha would be outraged – even at the savage age of six and a half she couldn’t bear to see any living thing suffer – and then he remembered, and wondered where such a cruel and unbidden thought had come from. Not for one moment, night or day, sleeping or awake, did he ever forget that she was dead. Not even in his dreams. 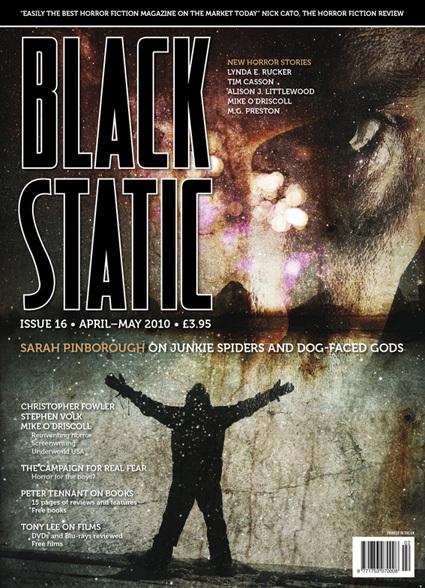 You can buy Black Static in good bookshops, newsagents and specialist stores, both here in the UK and several other countries including the USA. If your local shop doesn't stock the magazine please ask them to order it in for you. You can also order Black Static via mail order distributors such as Fantastic Literature and BBR, or download an e-version from Fictionwise (see link). By far the best option though, for you and for us, is to take out a subscription to the magazine direct: please just click on the link to our secure SHOP, where you can buy our stuff with a credit/debit card or paypal. Thanks! We appreciate your support more now than ever. Borders closure cost us a lot of money, and our ex-distributor hasn't paid us anything at all ever. We hope you enjoy this issue and look forward to reading your comments. Last edited by Andy on Sat Jun 12, 2010 10:27 am, edited 1 time in total. Arrived in Norfolk today, and it looks absolutely lovely. I particularly like the new format for the contents page. Ali's story opens with an image of Marilyn Monroe, and so we get a painting of a creepy old man. Arrived in SW France today (safe & scary) - like the use of colour, especially on the story illustrations. I presume it arrived by train then. Most overseas subscribers will have to wait for the ash cloud to dissipate. Just blogged on Pigasus Pressure with ratings for all DVD & blu-ray reviews. Oh, and see end of my column, on page 43, for a sneak preview of next issue's cover artwork! There's one on page 50... sneaky that! It looks absolutely fantastic, specially the full colour and the contents page and pretty much all the art work. Will the full colour be a permanent feature? Got my copy last night...looks fabulous. Just received my copy in sunny Wiltshire. Just debating whether I like the addition of colour. Got mine this morning (along with Cabin Fever 2 - cheers Andy!) Haven't had time to read anything in it yet but I've skimmed through and checked out the colour. I don't hate it, but it certainly gives the mag a different feel. I kind of liked the starkness of the old black and white pages, but it works really well for some sections(for instance: the colourful array of DVD covers found throughout Blood Spectrum). I think, like all change, it'll grow on us with a couple of issues. Quite possibly I was unsure about the starkness of the old black and white pages when I read issue one too, but grew to know and love them with time - so long as the writing remains fantastic, all the rest is really just trimming. Just debating whether I like the addition of colour. Welcome to 21st century, Steve!